And Now The Noble Promise, After Seven years. You Might Weep! People tend to be naturally fond of surprises, and sometimes it can happen in the most unexpected ways! When you hear the story of Ben Moser and Mary Lapkowicz, you’re going to be in love! In second grade, Ben noticed that Mary was often excluded in some activities, so he did the unthinkable! 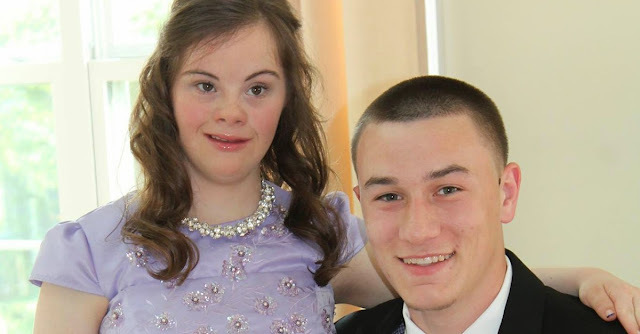 In fourth grade, he promised to take her to prom. He even stopped a game one day when Mary wasn’t in and he and his classmates decided to give her a chance to score, and they did! The two grew to be great friends as they played together, and Tracey Spogli, their teacher, didn’t miss a thing about it! From Tracey’s own words, Ben never let Mary get excluded from any activity. He always found a way to pull her in! But Mary transferred to another school district when they got to sixth grade, and they lost contact. She became the equipment manager for her school team, and he grew to be the star quarterback of his school team. And that’s when things got hot! Their two teams met to play each other, and Mary and Ben were re-united, and what happened next blew my mind! Watch the clip and see what happens! Get set for a very wide smile! You need to SHARE this! Mary and Ben first met in second grade. Though some of the other kids excluded Mary, Ben made an extra effort to befriend her. In fourth grade, Ben promised Mary that he would one day take her to prom. However, in sixth grade Mary changed school districts and the two drifted apart. When Ben and Mary’s school football teams played each other, they reunited and Ben knew he had to make good on his promise. Needless to say, their families were pretty excited about this milestone. Mary’s brother, Tom, wrote a special thank you to Ben on Facebook. SHARE if you’re glad Ben kept his promise!